Durian Cempedak are oval, irregular-shaped fruit of varying sizes. An average size for the fruit is around 12 centimeters in diameter, by 25 centimeters in length, and with a weight of up to 900 grams. The outer skin, brownish green in color, is patterned with raised, hexagonal soft spikes. 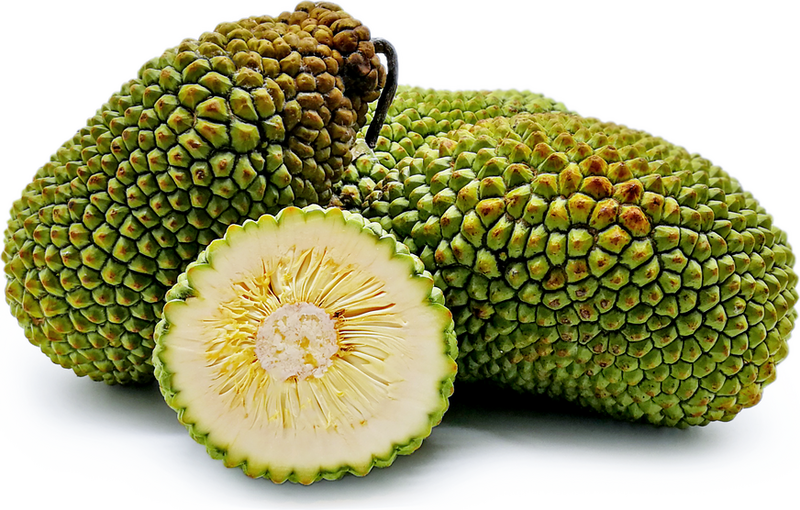 The fruit is extremely pungent, and reminiscent of durian and jackfruit. When cut open, the fruit exudes a sticky, glue-like white sap. Each fruit bears four to 16 elongated inner seeds which grow separately within the fruit, and are around 3 centimeters in diameter by 2.5 centimeters in length. Each seed is covered with a thick layer of edible flesh. The flesh is creamy yellow to orange in color. It is as soft as custard, and has a caramel, sweet, slightly musky flavor with hints of mango. When measured on the Brix scale, the flesh of the Durian Cempedak are at between 10 and 16. Durian Cempedak is available year-round, with a peak season in the spring months. Durian Cempedak are a tropical fruit. They are a variety of Cempedak, botanically classified as Artocarpus integer. These fruit belong to the Moraceae, or mulberry, family, and are related to jackfruit, bread fruit and figs. Durian Cempedak is a variety of the Cempedak, and is rarely seen outside of Asia. Durian Cempedak contains fiber, vitamin B, vitamin C, carotene and antioxidants. Durian Cempedak is best eaten fresh out of hand. To use, cut the fruit open lengthways, taking care not to bruise or cut into the seeds. Peel apart the flesh, and dig the seeds out by hand, or using a spoon. Cutting into the fruit will cause it to exude its sap, which becomes stickier over time, or with the application of water. As such, cover your cutting surface, hands and knife with oil before handling the fruit. To get excess sap off your skin and knife, douse with more oil and rub off before washing. Store Durian Cempedak at room temperature, where they will be good for five to seven days. As with some varieties of durian, the appearance of Durian Cempedak in local markets is usually a cause for celebration among fruit lovers. Durian Cempedak was registered in Malaysia around 2013, and has been shown at trade exhibitions around the country. It is mainly grown on the island of Borneo. Durian Cempedak may be found in small quantities around the Southeast Asian region.